Deep, stunning and inspirational colour blue will give your home a relaxed and open look. Whether you use its darker shades or pale muted tones, blue will help you create an atmosphere of serenity and tranquillity in your home. Its calming nature is perfect for transforming your living space into a soothing sanctuary, while its neutral character will provide you with plenty of opportunities to experiment with interior design. Here are some great ideas how you can give your home an enticing visual appeal by using blue. Owing to the neutral nature of blue, you can mix different patterns in your living room without creating an overbearing look. For an authentic yet cohesive and balanced ambiance, you can use an ethnic-inspired living room design connected through the theme of eastern influences and the colour. Blending traditional elements with fresh blue Indian and other Eastern-inspired prints with classic furniture pieces will give your living room a soothing, elegant visual appeal. 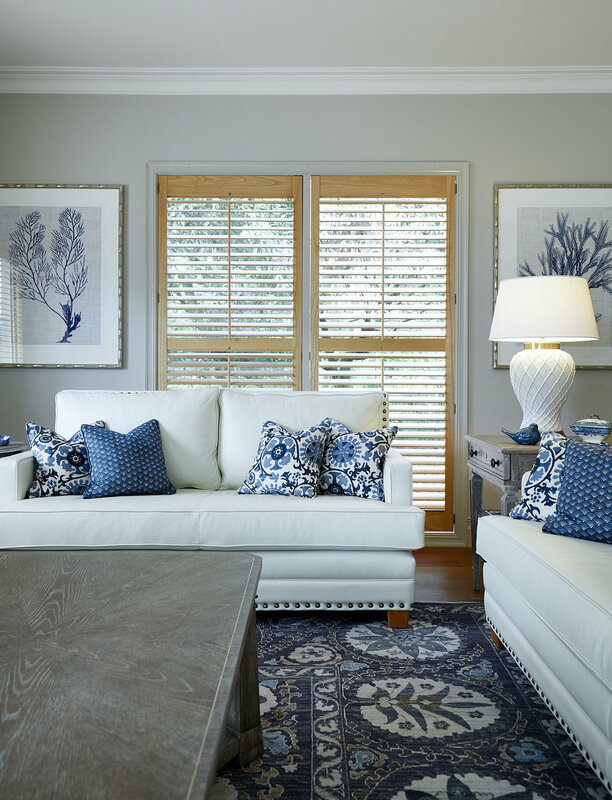 You can also introduce unexpected coastal elements, such as the window shutters in a warm wooden hue and a palette of coral and basic ivory whites, for the wow effect. A stunning Persian rug with blue prints will work perfectly with such an enticing design and give your living room a warm, layered look. Since blue inspires relaxation, it’s a perfect choice for your bedroom. 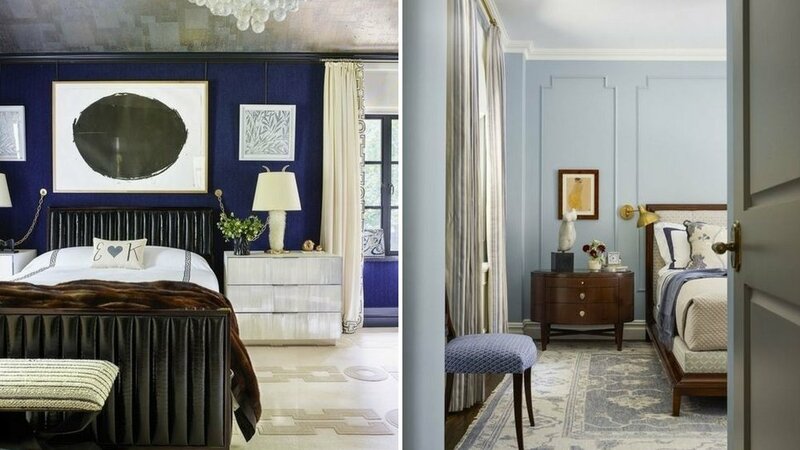 Painting your bedroom walls in a deep, royal blue will help you create a luxurious look. With such a stunning and eye-catching backdrop, neutral colours like beige will bring about balance and harmony. Since this is quite a bold move, you should aim for a simple, understated design for the rest of your bedroom. You can introduce lovely throw pillows in a blue hue and opt for a pale wooden finish for your nightstands. However, if you’re not ready for such a big step, you can go with a white backdrop and an elegant white bed and then introduce a lush blue area rug to liven up your space and create a comfortable and cosy atmosphere. Contrary to the popular belief, designing a luxurious bathroom isn’t that difficult. Often a single element can create a glamorous and luxurious look. Phenomenal and unique baths can always create an elegant atmosphere in any bathroom. All you need to do is invest in a lovely bathtub that will work as a focal point in your home spa and install intricately designed dark blue tiles. A blue-and-white combination in your bathroom will give it a pure and airy look, perfect for your personal sanctuary where you can unwind. 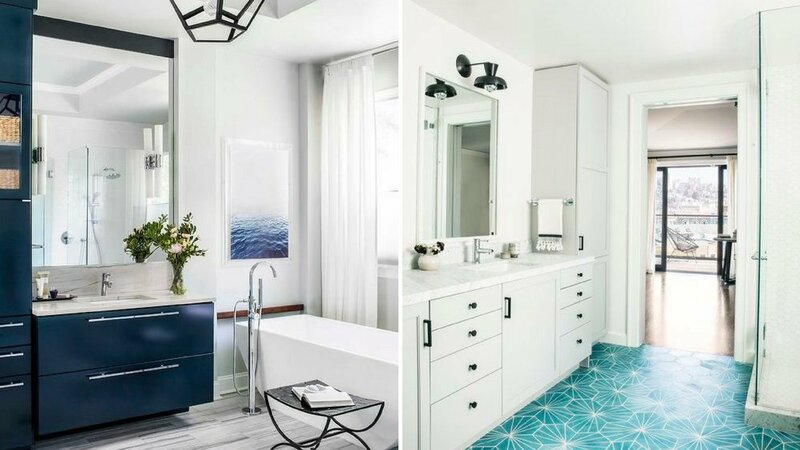 You can also go with marble tiles, a classic and timeless choice, and then use blue for different elements, such as your towels, shower curtains or an elegant area rug with blue patterns. Pairing up a blue-grey backdrop with lovely wooden furniture pieces will help you create a stylish contrast. If you want to create a bold look, you can always go with a blue statement wallpaper for a truly stunning effect. A blue-and-white combination isn’t typical only of a bathroom design. By combining these two colours you can create a rustic-modern look in your kitchen, especially if you introduce wooden finishes for your floor or cabinetry. For a unique visual appeal, you can try an ombre look with a pale blue gradually turning into white. Introducing a pop of grey will contribute to the harmony of your kitchen as it goes perfectly with a white-blue design. You can even use blue for a single detail in your kitchen, such as the kitchen island, and create a stunning décor statement. Pair it up with a white marble countertop and kitchen cabinets, as well as wooden shelves and antique cupboard, and you’ll create a mesmerising rustic-modern kitchen ambiance. Blue offers numerous opportunities for experimenting with different patterns and themes that can give your space a unique visual appeal. Whether you use it as a dominant hue or just in small doses, blue is always a stunning choice.